AAA Furniture Doctor, Vancouver's largest furniture repair and restoration company, has established a reputation for excellence that is unmatched in the industry. Our success is firmly rooted in our dedication to providing our customers with unparalleled craftsmanship and quality service. Utilizing exclusive, technologically advanced equipment, products and processes, the expert technicians of AAA Furniture Doctor can revitalize your valuable furniture and wood pieces, restoring and enhancing their natural beauty and strength. These skilled craftsmen meticulously remove the telltale signs of age and use, virtually erasing scuffs, gouges, water rings, and dents. 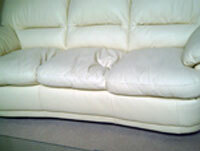 Upholstery, and other services provided by AAA Furniture Doctor can give your wood surfaces a fresh, new look. 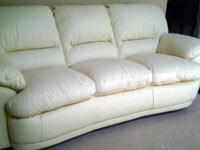 Even broken, water damaged and fire-damaged pieces can often be repaired to like-new condition. We proudly serve Vancouver, Burnaby, Port Moody, Coquitlam, Port Coquitlam, Pitt Meadows and Maple Ridge, Mission, Abbotsford, Surrey & Langley. AAA Furniture Doctor took this sofa and fixed it to look like this.